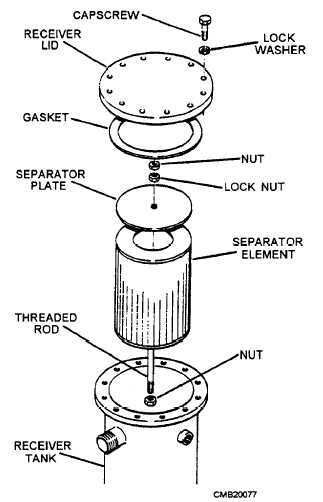 The demister, or separator element, is located inside the receiver tank (fig. 3-55). Replacement of the demister is indicated by the maintenance indicator (usually mounted on the receiver tank but also can be remote-mounted) or any sign of oil in the air at the service valves. You can reach the demister after removing the plate on the end of the receiver tank. As in hydraulic systems, fluid contamination is the leading cause of malfunctions in pneumatic systems. In addition to the solid particles of foreign matter that find their way to enter the system, there is also the problem of moisture. Most systems are equipped with one or more devices to remove contamination. These include filters, water separators, air dehydrators, and chemical dryers. Most systems contain drain valves at critical low points in the system. These valves are opened periodically to allow the escaping gas to purge a large percentage of the contaminants, both solids and moisture, from the system. In some systems these valves are automatic, while in others they must be operated manually. Removing lines from various components throughout the system and then attempting to pressurize the system, causing a high rate of air flow through the system, does complete purging. The air flow will cause the foreign matter to be dislodged and blown from the system. If an excessive amount of foreign matter, particularly oil, is blown from any one system, the lines and components should be removed and cleaned or, in some cases, replaced. Keep all tools and the work area in a clean, dirt-free condition. Cap or plug all lines and fittings immediately after disconnecting them. Replace all packing and gaskets during assembly procedures. Connect all parts with care to avoid stripping metal slivers from threaded areas. Install and torque all fittings and lines according to applicable technical manuals. Figure 3-55. - Demister (separator element). All compressed gases are hazardous. Compressed air and nitrogen are neither poisonous nor flammable, but should be handled with care. Some pneumatic systems operate at pressures exceeding 3,000 psi. Lines and fittings have exploded, injuring personnel and property. Literally thousands of careless workers have blown dust or other harmful particles into their eyes by careless handling of compressed air outlets. If you ever have to handle nitrogen gas, remember that it will not support life, and when released in a confined space, it will cause asphyxia (the loss of consciousness as a result of too little oxygen and too much carbon dioxide in the blood). Although compressed air and nitrogen seem safe in comparison with other gases, do not let overconfidence lead to personal injury.